Amy is a Doctor of Physical Therapy with 13 years of experience. She has primarily practiced in an outpatient orthopedic setting but also has experience with sports medicine and aquatics. 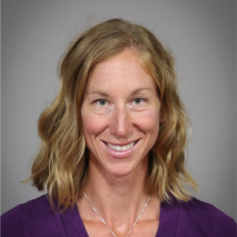 Amy graduated from the University of WI-LaCrosse in 2004 with a Master’s in Physical Therapy and then from Regis University in 2007 with her Doctorate in Physical Therapy. She also is an orthopedic certified specialist (OCS) through the American Physical Therapy Association, which she earned in 2010. Amy is married and has one energetic son who keeps her on the go! She enjoys spending her free time with her family. She enjoys cycling, traveling, gardening, reading, camping, and going on adventures near and far. She is passionate about leading a healthy lifestyle and it brings her joy to share that lifestyle with others.